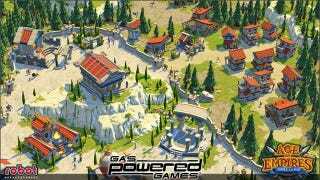 With two civilizations under its belt, Robot Entertainment tags in Chris Taylor's Gas Powered Games to handle further development of Microsoft's eagerly anticipated strategy game Age of Empires Online. What gives? Made up of former members of Ensemble Studios, dissolved by Microsoft after creating Halo Wars for the Xbox 360, Robot Entertainment was formed in order to work on original intellectual property, so when the team was tapped to build Microsoft's Age of Empires Online, the persistent-world version of the popular strategy game series, it seemed like a rather odd development. And now there's another odd development. Today Microsoft reveals that Robot Entertainment is no longer working on the game, replaced with Gas Powered Games, the developers behind Supreme Commander and Dungeon Siege. Apparently this was all part of the plan. Following today's announcement I contacted the folks at Robot Entertainment, whom I had spoken to just last month regarding the reveal of Age of Empire Online's cost structure and Egyptian civilization. They pointed me to a PC Gamer interview with president Patrick Hudson, who explained that the changeover was planned from the beginning. "Robot was founded to work on original IP, but working with AoE was a great way to get the company off the ground. The plan was always to move to original IP as soon as we had the ability focus on our core business goal." So Robot has built the platform, and now they're ready to focus on original titles like Orcs Must Die!, while Gas Powered Games builds new content for Age of Empires Online. From what I've seen of Age of Empires Online, Robot's built a strong foundation for an excellent game. Here's hoping Gas Powered Games stacks some great content on top of it.